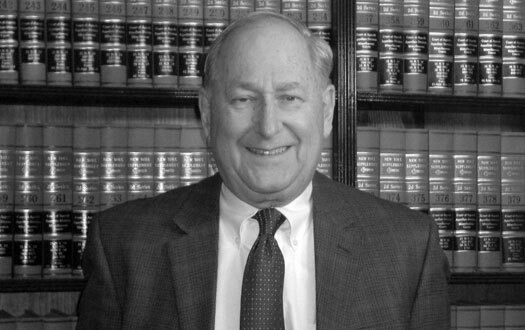 As a pioneer in the field of divorce mediation and founder of one of the oldest and largest divorce mediation facilities in the United States, Lenard Marlow is the author of numerous books and articles on the subject of divorce mediation. Divorce is never easy. On the contrary, it is one of the most difficult experiences that anyone will ever be faced with in his or her life. It will test them as few things ever have or ever will. Nevertheless, it does not have to become the nightmare that so many couples unwittingly make of it. It is possible to get through it and still keep one’s life intact. The Two Roads to Divorce shows how that is possible. It provides the insight, understanding and wisdom, born of years of experience, that has enabled countless numbers of divorcing couples to do that. Its purpose is to inspire others to believe that they can as well. Exposing the legal mythology that causes divorcing couples to place their lives in the hands of lawyers, and then to blindly march off and do legal battle with one another, Divorce and the Myth of Lawyers exposes the tragic consequences that await them when they do. Taking its readers into the offices and conference rooms of divorce lawyers, it reveals how they think and act, and what they do and say. It reports just how our adversarial legal system works, and why it so dismally fails all of those whom it is supposed to serve. Most important of all, it shows just how it is that lawyers take the practical problems that divorcing couples are faced with and make them more difficult, rather than less difficult, to resolve. Finally, it contrasts how these same problems are addressed and successfully resolved by divorce mediators, not in month and years, and not at the price of a king’s ransom, as has unfortunately become the rule in adversarial divorce proceedings, but in only a fraction of that time and at only a fraction of that cost. It would never occur to husbands and wives to turn to lawyers or the law in their marriage. Rather, when faced with questions that they have to answer, they do this pretty much on their own, based on their Common Sense. Nevertheless, their marriage and their divorce are not the same. Thus, though their common sense may have been sufficient in the past, it may not be now, which is why they are going to need help. Where are they going to turn? There is only one place that they can and that is the law. If the law will provide them with answers to their questions, it will have been of great help and deserves to be complimented as representing Legal Sense. However, if all that it does is leave them with a never ending debate as to what the right answers are, it will not have been of any help, and it should be labeled for what it is, namely Legal Nonsense. That, unfortunately, has been and continues to be the sad legacy bequeathed to divorcing husbands and wives who have turned to the law. They are not given any help. All that they are given are false levels of expectation that are then inevitably followed by equivalent levels of disappointment. 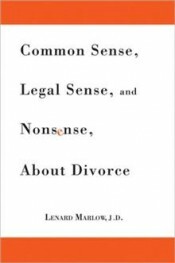 This book argues that divorcing husbands and wives deserve better than they have been given, and shows how turning to the law can be transformed from representing legal nonsense to legal sense. Divorcing couples look to the law for answers. Moreover, they not only expect that they will be given the right ones, but that those answers will also be clear. As a lawyer would put it, the law must provide an appropriate balance between equity and certainty. To be guaranteed that their answers will be the right ones, our adversarial legal system insists on two things. First, they must be judged by a legal yardstick. Second, they must employ a particular method of validation. The measuring must be done by separate lawyers rather than one. Its justification for this is that the two of them have what it refers to as conflicting interests. It is those conflicting interests, so it claims, that render it inappropriate for one lawyer to do the measuring. Unfortunately, the answers that the law provides are not clear. Its method of validation is enough to guarantee that. But suppose that they were not right either. Suppose that it is not possible for the law’s construct and the rules that it employs to give expression to that construct (what it refers to as our equitable distribution laws) to do equity. In other words, suppose that the most that the law can do is tell us what the wrong answer is, not the right one. Where would that leave us? It would leave us where we now are, with neither clear answers nor right ones. This book argues that the very nature of our adversarial legal system and its method of validation is such that it necessarily favors equity over certainty. Ironically, since it is not possible for the law to give us the right answer, what it leaves us with is neither. In other words, the law fails divorcing couples on both counts. It does not help them to get it right. And it does not help them get it done. For that reason the sad legacy that our adversarial legal system has bequeathed to divorcing couples is simply to have given them false levels of expectation that are then inevitably followed by equivalent levels of disappointment. An appreciation of the law’s failure here would cause us to re-examine our attitude toward the law. If it cannot provide us with equity, it should at least provide us with greater certainty. This, in turn, would cause us to question how divorcing couples obtain information about the law. If the only thanks that they will get if they employ the law’s method of validation is to be left with different answers to the same question, then they must be permitted to pose those questions in a way that will leave them with an answer, or at least a narrow range of answers, not just a debate going nowhere as to what that answer is. 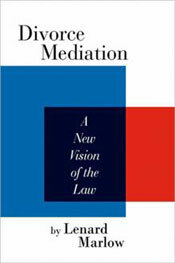 That is the new vision of the law called for in this book.